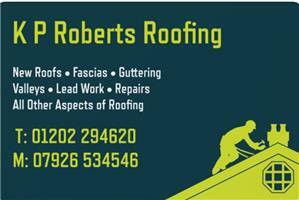 K P Roberts Roofing - Roofer based in Bournemouth, Dorset. Hello and welcome to K P Roberts Roofing. We have over 25 years' experience within the Roofing industry and K P Roberts Roofing has been established since 2016. We pride ourselves in delivering a friendly, reliable and prompt service to all customers, please see our services page for information on the services we provide or give us a call today. Thank you for taking the time to visit our Checkatrade page, we look forward to hearing from you.